An international team led by scientists from the University of Hawai‘i at Mānoa (UH Manoa) recently returned from a 34-day expedition to study deep-sea biodiversity and ecological processes in the western Clarion-Clipperton Zone (CCZ). 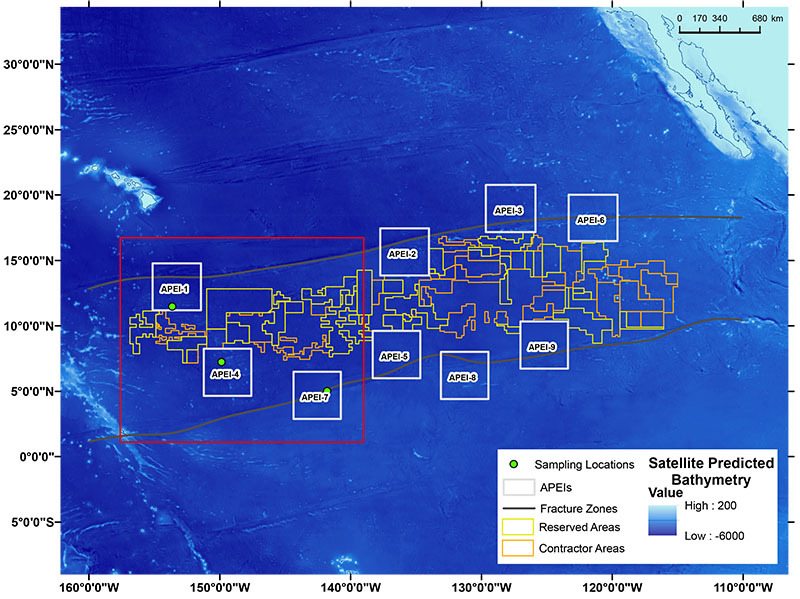 The expedition, aboard the UH-operated research vessel Kilo Moana, studied an area in the Pacific Ocean where numerous manganese nodule mining exploration claims are located. See footage from the expedition and learn more about why scientists are exploring the depths of the Clarion-Clipperton Zone. This video gives an overview of what we found, including video captured from the seabed. Video courtesy of the DeepCCZ expedition. Download larger version (mp4, 168.8 MB). 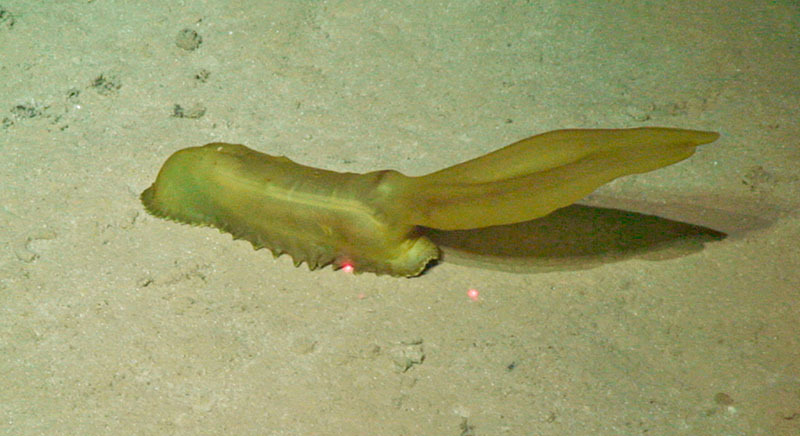 A large sea cucumber, Psychropotes longicauda, on the abyssal plain. Image courtesy of the DeepCCZ expedition. Download larger version (jpg, 2.5 MB). More than one million square kilometers of the abyssal Pacific seafloor have been identified for possible seafloor nodule mining. Manganese nodules are a potential source of copper, nickel, cobalt, iron, manganese and rare earth elements—metals used in electrical systems and for electronics like rechargeable batteries and touch screens. Map of the abyssal Pacific seafloor targeted for seafloor nodule mining showing the areas where mining contactors will work and areas protected from mining (APEIs). This project studied three protected areas in the west of the Clarion Clipperton Zone. Map courtesy of the DeepCCZ expedition. Download larger version (pdf, 6.5 MB). Deep-sea nodule mining is expected to result in the destruction of marine life and seabed habitats over large areas; this destruction has the potential to occur within sites directly mined as well as in adjoining areas impacted by sediment plumes created by mining activities. The abyssal plains cover roughly 70% of the global seabed and are the biggest habitat on Earth’s surface. These seafloor habitats remain among the most poorly studied on the planet because they are remote and require specialist equipment to study. Yet they may harbor an extraordinary diversity of organisms ranging from giant sea cucumbers to novel bacteria. The research cruise, dubbed the DeepCCZ Expedition, was the first to study the wealth of organisms on seafloor plains and seamounts in areas currently designated as “no-mining areas” in the western CCZ. A major goal is to determine whether these protected areas are adequate to conserve the biodiversity in the region from the destructive activities of seafloor mining. The expedition made 12 successful dives with UH’s new remotely operated vehicle (ROV) Lu’ukai, which used robotic arms and deep-sea cameras to photograph and collect animals, manganese nodules, and sediments from greater than three miles deep. More than 100 species of large animals were collected or videotaped at the seafloor, many of which appear to be newly discovered species. The team recovering the ROV Lu’ukai on the deck of the R/V Kilo Moana after a successful dive. Image courtesy of the DeepCCZ expedition. Download larger version (jpg, 3 MB). In addition to the ROV, the expedition used a broad suite of new deep-sea technologies to study the biodiversity and ecology of abyssal organisms ranging from bacteria to meter-long fish. State-of-the-art equipment designed to function at the enormous pressures of the abyssal ocean (more than 7000 lb per square inch) included an autonomous respirometer that descended to the seafloor to measure biological activity and food-web structure of deep-sea sediment communities, and baited stereo cameras that attracted and measured the mobile predators at the top of the deep-sea food chain. DNA samples were also collected from the environment, and from individual animals, to test new approaches to assess biodiversity and ecological functions of microbes and animals living in sediments, on manganese nodules, and in the waters above. DNA samples from the animals collected will also aid in the identification and description of the many new species, and to assess their occurrence across the abyssal Pacific Ocean. The data collected on this cruise will take many months to fully analyze, and is expected to substantially improve understanding of the biodiversity and ecology of the vast and poorly studied CCZ. The scientists will use these data to help assess the adequacy of conservation measures presently in place to protect deep-sea biodiversity in the face of seafloor mining. These data will also be incorporated into a regional synthesis of the CCZ, to be used to make science-based recommendations to the International Seabed Authority and other stakeholders concerning environmental protection and management for deep-sea mining in the CCZ. 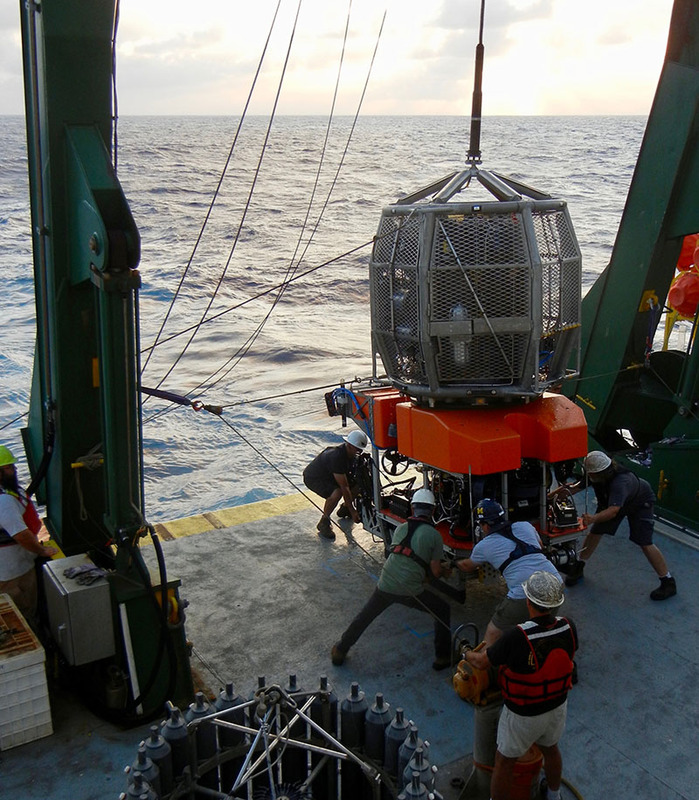 The DeepCCZ Expedition was funded by the Gordon and Betty Moore Foundation, the NOAA Office of Ocean Exploration and Research, the Pew Charitable Trusts, and the University of Hawai‘i. Project principle investigators include Craig Smith, Jeff Drazen, and Erica Goetze of the University of Hawai‘i, Eric Vetter of Hawaii Pacific University, Matt Church of University of Montana, Andrew Sweetman of Heriot Watt University, UK, Adrian Glover of the Natural History Museum, UK, and Thomas Dahlgren of the University of Gothenburg, Sweden.